When I first dove into the New Age music world back in the mid- to late-80s, Steven Halpern was a personal favorite. Like any good crystal-wielding listener, I had my copy of Chakra Suite and I often let Halpern’s signature stair-climbing scales on his Rhodes Mark 7 electric piano work their harmonic magic on aligning my energies. His song “Radiance,” which I believe originated on his album Jonah’s Journey, and was later reworked for another release, still resonates with me emotionally. Even so, as my tastes segued out of the New Age space, I sort of lost track of Halpern. I re-upped a digital copy of Chakra Suite a few years back, mostly for nostalgic purposes, but it had been a long time since I listened to his music. So it was a pleasant surprise when his latest–and Grammy-nominated–release, Deep Alpha, showed up at my door and showed me, at first listen, that I was still a pretty solid Halpern appreciator. 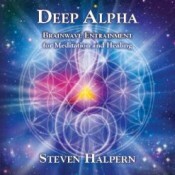 Between the pure-sinewave tones of the Rhodes and a bit of aural engineering, Deep Alpha quickly accomplishes its mind-massaging mission, as stated in the disc’s full title, Deep Alpha: Brainwave Entrainment for Meditation and Healing. Halpern is assisted by oboe from Paul McCandless, who also lent his graceful sounds to Peter Kater’s recent disc, Light Body, fretless bass legend Michael Manring, and one of my favorite touches, a sample of tambura drone from Warren Kahn. McCandless is featured on the opening track, his woodwind singing over those familiar, glittering keyboard runs and an undercurrent of synth. Manring and Kahn drop into the mix on Part 3, the hum of the tambura entwined with the background washes as the keys and bass swap phrases with a hint of jazzy intent. This is one of the things I quite enjoy about Deep Alpha; it has its very New Age-y, healing-music core, but the music often rises above what the framework might suggest. Folks who roll their eyes at the hint of such a modality will miss out on the number of good, fairly straightforward compositions here. The healing aspect is going on around the music regardless. Halpern also switches things up and takes on a more ambient stance in some tracks. Part 5, for example, is five minutes of salving drift. Part 8 is another, focused on Manring’s bass, buoyed by curling synth lines and more long, soft washes. Part 11 builds from Kahn’s tambura again, with angel-choir pads singing backup. These shifts in approach help to keep the sound of the Rhodes from wearing thin; when it re-appears after a more ambient stretch, its clear, ringing tone is a refreshing wake-up call. The disc closes out with the traditionally New Age, always-soothing sounds of the ocean. Each time I’ve gone through a full listen I have come away very much relaxed, my head a little clearer, and ready to hear it again. A great release that fulfills its mission statement with grace and beauty. Available from Steven Halpern’s web site. Another spot-on review! I may as well retire at this rate. You’ve got my genre(s) covered apparently! LOL I completely agree, BTW, with how you characterize this album. It WOULD appeal to a lot of “warm” ambient fans, I’m confident of that. But they’re liable to be scared away because of the artist and the whole new age stigma. Oh well, their loss. Keep up the fantastic work. Thank you, Bill. I have to admit that when I first put it on and heard that signature twinkling scale, I thought, “How has this not changed?” Yet the further into I went, the better I understood. And yes, the “healing music” approach can be, in my opinion too, a barrier folks need to work around. But in this instance, it’s worth setting aside that prejudice and having a go.